You arrived. You found your seat and the event began. You didn't need to queue and, if all went to plan, there was no need to fight for your seat. You didn't even have to wear down your redialing finger when you made your reservation. Now that fax or post have taken over from the frantic first-come first-served telephone system, and last minute reservations can easily be made during the final week, the process of reserving seats is at last becoming more simplified. "It's been smooth and calm," says Steve Colony, who has helped in the reservations reception area during this event. Randy Waterhous, who has been involved in seating since 1995, confirms this: "There have been very few last minute problems to solve." It is perhaps a commonly held misconception that the seating processing fee covers the cost of the event. "In fact," explains Eric Reinemer, who helps with event finances, "the processing fees cover 25% to 30% of the total costs. It is always the spirit of contributions that helps to pay the balance." "Every contribution, large and small, makes a huge difference towards making the event successful." The equipment is decidedly low-tech: a small flashlight, a notepad and a pen. But add a little consciousness - and a large dose of the desire to participate - and you have the ingredients of a group of people who make a significant contribution to how it feels to be at an event such as the one here in Miami. Most people probably think of ushers as the folks who show you to your seat. Or, the ones you run to if you get there and someone's already in it. Marcia Newman, the Usher Manager for North America, has another perspective. "There are literally thousands of things that ushers are involved in. We interface with virtually every aspect of the event - ranging from luggage to medical evacuations." Tina Grey has been ushering for a number of years and notes that she's seen an evolution in the service. "The quality expectations have grown tremendously. You see it in every part of the service. There's a degree of awareness and thoughtfulness that's developed that's very inspiring. Trying to live up to this kind of quality is changing my life." The "ushering" in of this new understanding of what it means to welcome and care for attendees at this and other events is a reflection of the emphasis on the quality of participation in general. And it comes full circle when an usher, for example, who's trying to facilitate these standards, realises that he is a guest himself. "It's just a wonderful feeling to be part of this," says Marcia, who is currently also managing ushering logistics for Montreal and the five events scheduled for July. "There are so many things to do and it can seem like a lot, but I have to tell you, I feel like Cinderella who's been invited to the ball." "Did you forget your seat number?" Right now, about 2,000 miles north of here, hundreds of people are quite literally setting the stage for the next stop on Maharaji's tour: Montreal, Quebec. The event starts in two days. And for the last six weeks they've been preparing the audio, setting up the video, arranging for translations, laying out the hall. calculating the seating plan - even making sure the thermostats are precise for the event on May 12 and a possible Knowledge session the day after. "I'm amazed at the level of detail required for an event like this. People have no idea about the degree of attention that goes into creating the proper kind of environment for Maharaji to do his work." The speaker is Mike Ryercy, who's been the event manager at programs in Toronto for the last 15 years and this time is coordinating preparations for the Knowledge session in Montreal. "In some ways even more preparation goes into planning the Knowledge session than the general event because for Maharaji it's one of the most special times. The entire environment needs to reflect consciousness." There are no instruction books. Each venue is different, each event unique. The only common thread is, as Ryercy says, "the need to bring as much consciousness to the preparations as possible." And, perhaps, computers. The floor plan for this event - Miami - required the assistance of Auto Cad, or computer-aided design. 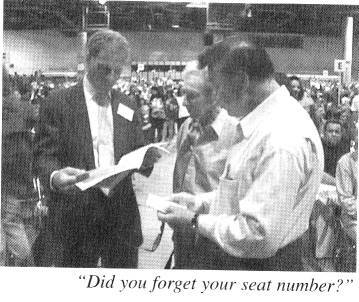 "The plan must be exact", says Ted Levitt, the event manager for Miami, "so the seating people can assign seats properly. If your drawing is off by even a few degrees that can mean an error affecting hundreds of seats. There's so much detail you can't imagine it. It's a real testimony to how much people love and care for Maharaj i." Danielle Fitzpatrick, the event manager for the Long Beach program on May 30, agrees. "Peoples'enthusiasm and willingness to be involved is what I'm struck by most. They're definitely feeling the response to what Maharaji said about participation on Saturday morning at the last Long Beach event. There are more conference calls, more people lining up and there's more information flowing than ever. It's the difference between 'It will happen' and 'I'll see what I can do'." While it seems as if May will turn out to be quite a busy month, the reality is that the opportunity to participate that Maharaji is offering promises to ensure that every month is a busy month. "We've been preparing for this for six months", says Cecile Beauvere, who is coordinating plans for the aspirant meeting in Montreal where people will be selected to receive Knowledge. "I have 50 people working with me just on that. It seems to be an ongoing thing. It just keeps evolving and evolving." Information about how to register for future events this year is available in the lobby.